RIGA, Latvia -- Hordes of shoppers were picking up food after work in the Latvian capital when an enormous section of the supermarket's roof caved in. Firefighters rushed in to save them, only to be crushed themselves when a second part of the roof collapsed. The death toll from the rush-hour disaster Thursday evening at the Maxima supermarket in Riga rose to 50 on Friday, including three firefighters, police said. Spokesman Toms Sadovskis said the death toll is expected to go even higher, and that two of the dead were still unidentified. At least 35 people were injured, 28 of them hospitalized, including 10 firefighters struck just as they entered the unstable building, the Fire and Rescue Service said. It was the largest tragedy for the Baltic state since it regained independence in 1991. Latvia's government declared three days of mourning starting Saturday. The rescue agency could not say how many people might be trapped under the rubble in the densely populated, working-class neighborhood between downtown Riga and the city's airport. The reason for the collapse was still not known, but rescue and police officials said workers had been building a garden and children's playground on the roof as part of a design combining the supermarket and a new 12-story residential building behind it. "They loaded so much material on that roof over the past two weeks that I simply don't understand," said Nina Kameneva, a retiree who lives on the 7th floor of an apartment building overlooking the supermarket. She said she and her husband were in the kitchen when the first collapse occurred at approximately 4:45 p.m. on Thursday - a jolt so powerful it shook their building, Kameneva said. She said they both rushed out onto their balcony, from where they saw survivors trying to scramble out of the store through a cloud of dust. Riga Mayor Nils Usakovs told reporters that large bags of earth and sand on a weak spot on the roof could have caused the collapse. An enormous crater-like hole gaped in the supermarket's roof, while building materials were still stacked on the remaining sections. Rescue workers kept up their round-the-clock search for possible survivors as darkness fell on Friday, periodically turning off all equipment and asking the relatives of missing people to call so they could pinpoint ringing phones. Dozens of firefighters carefully sifted through the rubble. Rescue agency spokeswoman Viktorija Sembele said the search for survivors was proceeding slowly, since both the rubble and the remaining sections of the roof were fragile and could easily collapse further if the wrong piece was moved. 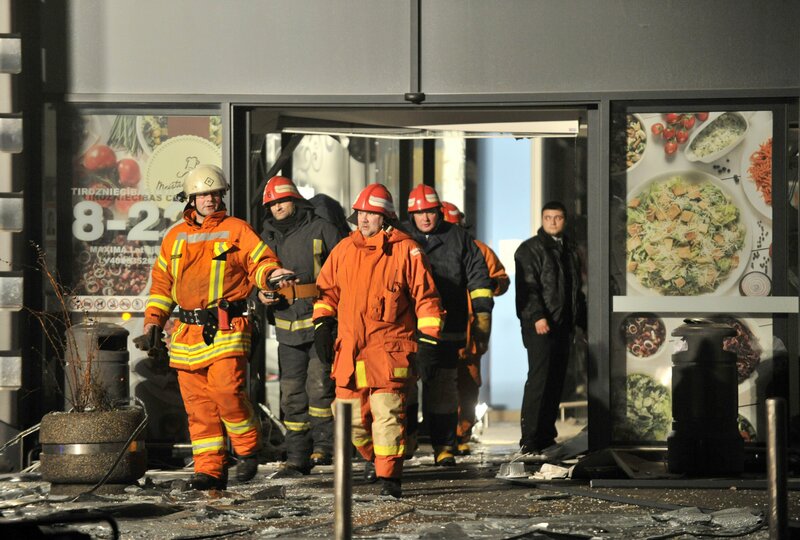 About 500 square meters (5,300 square feet) of the roof collapsed, the rescue service estimated, destroying large sections of the store's high walls and nearly all its front windows. Several large construction cranes gingerly hauled metal slabs and other debris from the central hole, while bulldozers cleared paths into the store. The building was completed in November 2011. The Lithuanian-owned Maxima was reportedly renting the space.